I left a note on the counter for my husband last night. I was up late doing stuff (I’m always doing stuff) and he had already gone to bed. I was getting things ready for an event I’m helping with and I couldn’t find our little condiment dishes with tiny spoons. 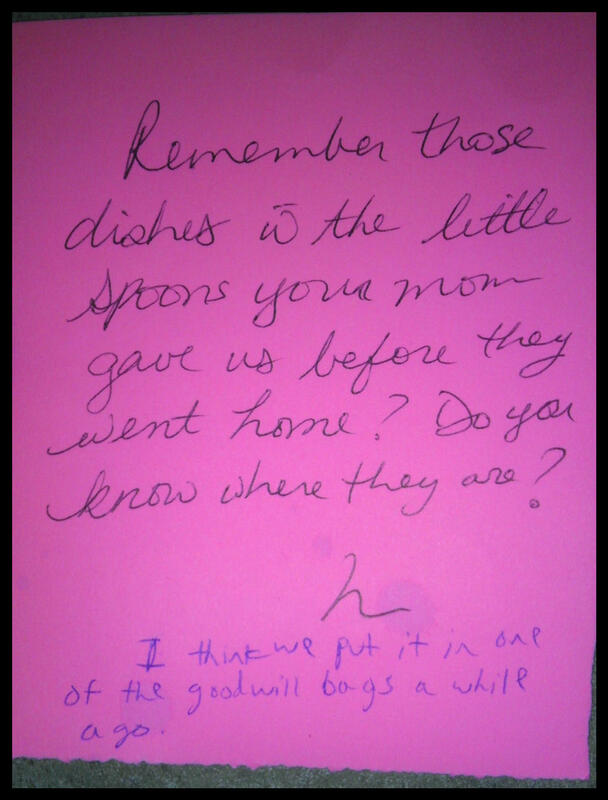 So, I wrote him a note and left it on the counter (he gets up first in the morning). It only took my brain another three seconds before realizing that, if I reply to my husband’s comment on this piece of paper, he will not respond until he gets home from work tonight and reads the piece of paper. I laughed at myself then carried on with the morning routine. What else could I do? Have you ever caught yourself applying technology habits to old fashion methods? This entry was posted in Uncategorized and tagged Family, Funnies, hand-written note, technology, text messaging, Writing on June 26, 2013 by Nancy.